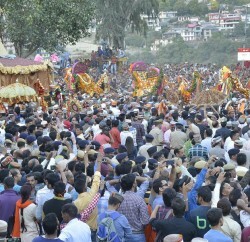 Kullu: The week-long International Kullu Dussehra concluded today with great fanfare and enthusiasm. 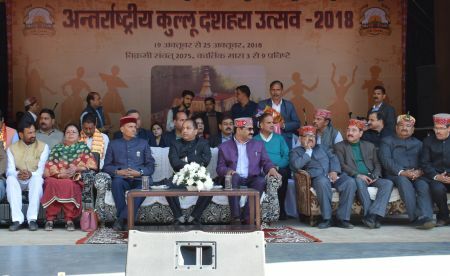 Chief Minister Jai Ram Thakur, who presided over the concluding ceremony announced to increase the nazrana (honorarium) paid to local deities participating in Kullu Dussehra festival by five percent and distance allowance by 20 percent. He also announced ten percent increase in remuneration of Bajantaris, who accompany the local deities to the festival besides making provision of Rs. 75,000 for Haripur and Manikaran Dussehra and Rs. 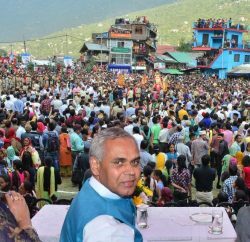 50,000 for Manikaran Dussehra festival. He said that Kullu Dussehra festival had been playing a major role in preservation and promotion of the rich culture of the state. This festival had historic, cultural and religious background and it was also famous as tourism, commercial festival in which people from the different corners of the country and abroad participates with great zeal and enthusiasm. 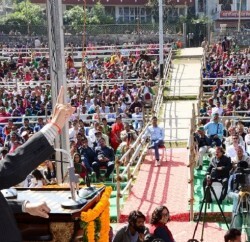 Jai Ram Thakur said that efforts were afoot to develop various places of the Kullu district for tourism activities. The government had taken a decision to connect Bijli Mahadev tourist destination with the rope-way. Under Udan-II project, the major tourist places of the state would be linked with heli-taxi service. Stressing the need to preserve environment along-with the culture, he appealed to the people of the state to help in maintaining pollution free atmosphere. The Chief Minister announced 3 percent Dearness Allowance to the state government employees and pensioners which will be payable from 1 January, 2018. It will put additional financial burden of Rs. 200 crores on the state exchequer. Jai Ram Thakur said that additional funds amounting to Rs. 4.50 crores would be provided for the completion of work on Atal Dussehra Sadan in Kullu and Rs. 4 crores for construction of modern building in the premises of the office of Deputy Commissioner, Kullu. The Chief Minister said that keeping in view the loss to the apple crop due to heavy snowfall in Lahaul-Spiti district during last month, the state government would procure apples at a rate of Rs. 20 per kilogram to give respite to the apple growers besides providing subsidy on apple plantation.